Dog Soldiers by Robert Stone. I first read Robert Stone’s novel about a heroin deal gone very wrong for the first time when I was a teenager but I reread it every couple of years as a reminder of how much can be packed into a thriller without sacrificing narrative momentum. Dog Soldiers is my Platonic ideal of what a thriller can be – it’s fast, violent, sharply written and conveys so much about what America, and particularly California, was like in the early 70s in the hung-over morning after the Summer of Love. It’s like Joan Didion with a higher body count. And it has an ending that reads like an update of The Treasure of the Sierra Madre, if you replace the gold with several kilos of heroin. Marathon Man by William Goldman. I remember Marathon Man as the book that activated every reading pleasure center in my brain in telling its story of an average guy who becomes enmeshed in an adventure involving espionage, deadly assassins and fugitive ex-Nazis. Like most thriller writers, I try to write books that you can’t put down, and this is my template for that kind of high-adrenaline storytelling. Is it safe? No, it is not safe. Presumed Innocent by Scott Turow. Turow’s groundbreaking legal thriller was published the summer before I entered law school at U.S.C. Although I didn’t start writing in earnest for several more years, it made writing a novel seem a little more possible. Presumed Innocent is still for me the gold standard in legal thrillers and a classic example of storytelling misdirection, hiding the killer in plain sight. As I labored over my first novel, the legal thriller THE INSIDER, I often had Turow in mind. For one thing, we were partners in the same law firm during much of the writing of that book. For another, Turow is said to have written Presumed Innocent while riding the train to work as a U.S. Attorney. I do much of my writing on the BART train heading in to San Francisco to my law firm job. Turow got off his train after Presumed Innocent, but I’m still very much on it. Uncovering the Sixties: The Life and Times of the Underground Press by Abe Peck. When I attended journalism school at Northwestern, Abe Peck was far and away my coolest professor. He had been a n editor of the Chicago Seed and at Rolling Stone during its early days. He had a photo of Iggy Pop on the wall of his office at NU. I was already enamored of the whole freewheeling ethic of the underground press, and had been busted on the playground in middle school for selling a humor magazine that I published with some of my friends. We aspired to vintage National Lampoon but ended up as sort of a more puerile version of Mad Magazine. Uncovering the Sixties tells the fascinating story of the rise and fall of various Sixties countercultural movements through the pages of the underground press of the era. The book cemented my fascination with DIY journalism and probably steered me on the path that led me to edit and publish a free arts and entertainment magazine for three years in Atlanta, after j-school but before law school. Neuromancer by William Gibson. I’m a privacy and cybersecurity attorney and my thrillers draw upon some of the scariest, most paranoia-inducing issues that I encounter in my practice. I name-checked Gibson in a couple of my books because I felt that respect must be paid. Although the technology has changed, Gibson’s cyberthrillers Neuromancer and the short story collection Burning Chrome still feel like dispatches from the future. They’re like some of David Bowie’s best records – no matter how many years pass, they still seem so cool and modern. Even without an overt reference, Gibson’s fingerprints are all over this entire genre, from “Mr. Robot” to my Chris Bruen series. 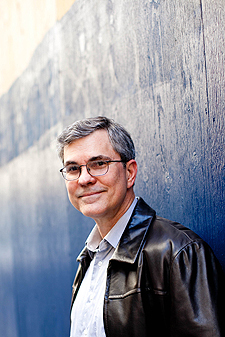 Reece Hirsch is the author of four thrillers that draw upon his background as a privacy attorney. His first book, The Insider, was a finalist for the 2011 International Thriller Writers Award for Best First Novel. His next three books, The Adversary, Intrusion, and Surveillance, all feature former Department of Justice cybercrimes prosecutor Chris Bruen. Hirsch is a partner in the San Francisco office of an international law firm and cochair of its privacy and cybersecurity practice. He is also a member of the board of directors of the Valentino Achak Deng Foundation (www.VADFoundation.org). He lives in the Bay Area with his wife and a small, unruly dog. His website is www.reecehirsch.com.